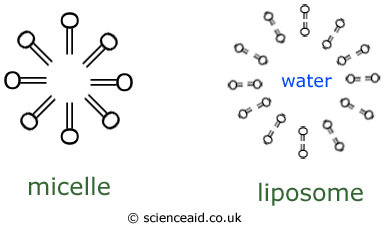 Lipids are fats and oils, they are important to living things because they form membranes. They are made of carbon, hydrogen and >oxygen. Below is a diagram of a glycerol molecule and then a fatty acid. These are two important parts in creating a triglyeride. The fatty acid with only single bonds between the carbon molecules is said to be saturated because they are saturated with hydrogen. However, if there are double bonds between carbon molecules (C = C = C) all of it's bonds are used up and no hydrogens can get in, this means in is unsaturated. It is an example of a condensation reaction where 3 water molecules are lost for every one molecule of triglyceride produced. A phosphlipid is similar in strucuture to the triglyceride but instead of one of the fatty acid chains, it has a phosphate . Alternatively, the phospholipids might form a phospholipid bilayer (similar to that seen in cell membranes). This is a ring of phospholipids surrounding an area of water. This structure is called a liposome.